The Ecotex Toiletry Bag is made from 6 recycled water bottles. By utilizing discarded materials to create new products Heys Offers an Eco-friendly choice for a clean and sustainable future. What is Ecotex ? The way in which you pack your toiletries has changed in recent history, as you can no longer pack them inside your carry-on - but instead must pack them inside your check-in luggage. Therefore the need to pack them flat, and save space becomes important. The Ecotex Toiletry Bag can not only be packed flat but also has 7 compartments for great organization and can fit full size bottles into its compact design and has a hook allowing it to be hung. At only 2" thick; it takes up little space , but will allow you to pack many bottles and pack them in an organized fashion. It does this by its innovative Flat Pack design - which forces you to pack your bottles in a straight line, and keeps them that way. This keeps them organized as well, as every bottle has its place. You will be surprised by just how much you can pack inside it. A special lining makes this bag virtually water-proof, and keeps any leaks from your bottles contained inside the Ecotex toiletry bag itself, thereby saving your clothes. 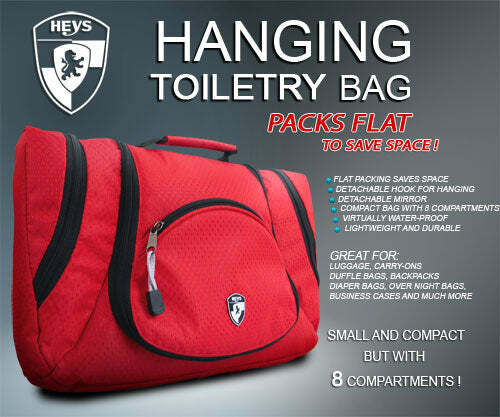 It has a detachable hook, making it ideal to hang on your washroom door or wall. It also comes with a detachable mirror for portable convenience. Not to mention a mesh pocket, a back-side zipper pocket, a carry handle, and corded double zipper pullers which makes for easy opening and closing. Can be used with Luggage, Duffel bags, Overnight bags, Business Cases and much more. 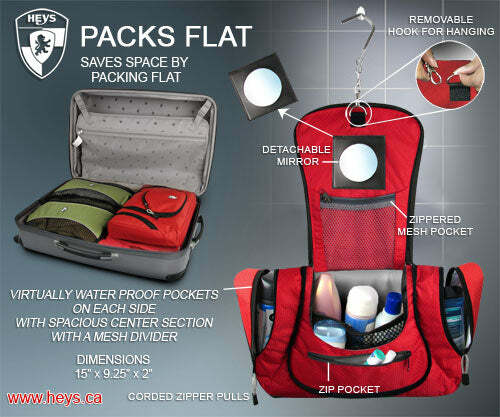 Packs Flat to save space!